Former Open champion Roberto de Vicenzo has died at the age of 94. The Argentine won the Claret Jug in 1967 at Royal Liverpool in Hoylake aged 44 to become the second oldest winner after Tom Morris, who was 46 in 1867. But he is perhaps best known for the scorecard error that cost him victory at the Masters the following year. De Vicenzo had just carded 65 to force a play-off against Bob Goalby but after his error came to light he memorably said: "What a stupid I am!" 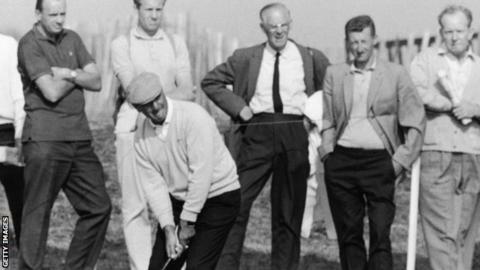 He was preparing to take on Goalby when it emerged playing partner Tommy Aaron had inadvertently marked down a four on his card at the 17th when De Vicenzo had actually made a birdie three. De Vicenzo failed to notice the mistake when he submitted his scorecard to officials so the higher score stood. In a 58-year career, De Vicenzo won more than 232 professional tournaments, most of them in his homeland and elsewhere in South America.